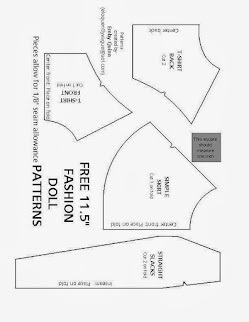 Nosing around Pinterest one day I found a really nice sheet of simple Free Barbie Clothes Patterns. They are from embyquinn. I tried to track down the written instructions but couldn't match these patterns up exactly. I haven't tried the skirt yet, and modified the shirt a bit here. But these pants are great and I wanted to share my notes and instructions along with the pattern pieces. What's that? You're having a hard time believing Barbie was helping stack fire wood??? I can't wait to skinny-up the pattern and make leggings out of a knit fabric! I saved the picture as a download. Then double clicked it and used the scroll wheel on my mouse to make the pic bigger. For the scale to be correct you want that little gray box to measure 1" across. I laid a piece of paper on my monitor and gently traced over it. The pants are a generous fit through the hips and thighs. 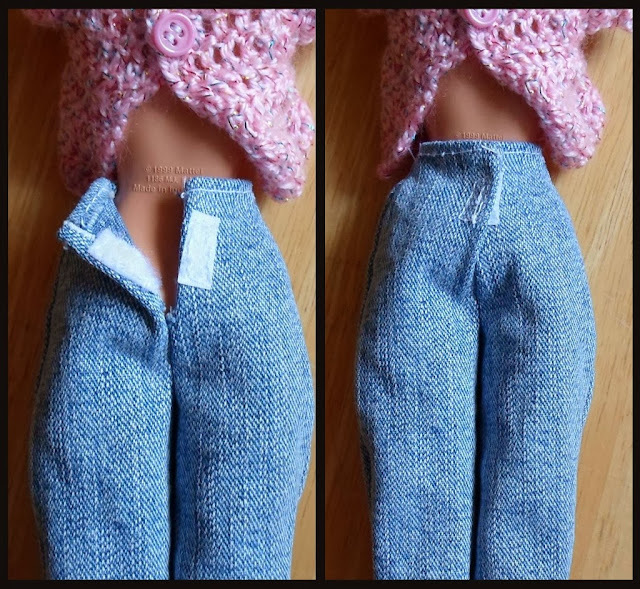 Now, while I might need a little extra room in those areas... Barbie does not. Since my fabric was denim (and didn't have any drape or movement), I did make the seam allowance a little wider through the hips and thighs. It's your call. Update: I found Emby Quinn's instructions HERE. So glad I did! Sew crotch area first-Sew from top of front seam around to notch of back seam. Back stitch. Fold waist bands over, front and both back pieces, sew hems. Fold both sides of fabric from notch up to back waist-like you're going to hem them. Correctly position velcro (um, double check this a couple times...) and sew velcro on each side to be able to close the pants. This will create the hem too. Side seams-I'm not sure how to describe this but flip the fabric so the side seams meet to make a leg (right sides of fabric together) and sew sides closed. I had to play with it for a while and somehow it finally made sense... Can anyone explain this better in the comments? Turn inside out, dress the doll and smile!